This month is looking more joyful and happiness for all people around this world , because Christmas's mood is back again for waiting to celebrations this festival about it . Whatever never forget about a popular figure in the christmas must be a Santa Claus , so that is looking so excellent for this celebrations too . About a Santa Claus also as known a " Father Christmas " in this festival , his always looking joyful with carring a beg with a full presents for all childrens with looking a good behaviour about it in this world . 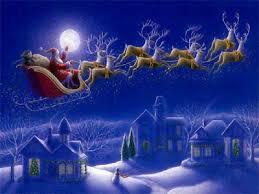 About me like a Santa Claus story because this looking a great legend and history in this life , whatever must be never forget too about his Flying Reindeers for pull the sleigh through the night sky to help Santa Claus deliver gifts to childrens on Christmas Eve .